What does 1 million pennies look like? 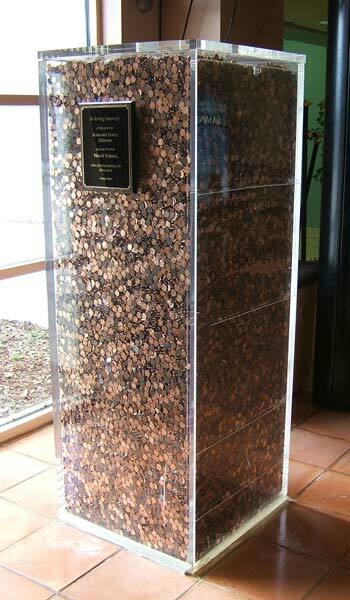 This is what 1 million pennies looks like. 1 million pennies is a total of 10 000 dollars and weights about 2.3 tons. An interesting fact about pennies is that because of the falling dollar 1 penny is actually worth more when sold as metal as opposed to its nominal value. The US government passed a special law that says it is illegal to sell pennies as metal. PS! If you have noticed that the amount of posts has dropped a bit recently it is because I am actually on a inflatable boat trip with some of my friends and the articles appearing here in FinancialJesus.com have been written before the trip and are automatically scheduled for release by WordPress! That looks pretty cool…what are the dimensions of that case and what does the plaque say? I don’t have $10,000 to change in to pennies, but if I did I probably wouldn’t do that with it….interesting how they are worth more as metal than currency huh? Thanks! There seems to be some nice extra pictures over there! Hmm yes, the fact that pennies are worth more as metal than they are as pennies just gave me an idea – we should export pennies to Mexico or Canada and sell them as metal. I doubt that they have laws against that in other countries…. I wonder if there are laws against exporting significant amounts of currency or anything like that…. I think there are – I have traveled quite a bit and crossing the border you are always required to declare your money if you have more than a certain amount with you. I think these laws are in place because of money laundering. That’s a great observation Art! Wow, maybe i should hold on to my pennies so that one day i can actually sell it as metal. Previous post: What is Estonia? Next post: What do you want money for?